The Department of Justice said the decision is not related to suspected arson attacks at the former hotel. THE PLAN TO open a Direct Provision centre at a disused hotel in Rooskey, Co Leitrim, has been scrapped. The Department of Justice said the decision is due to a leasing issue and not related to suspected arson attacks at the former hotel. 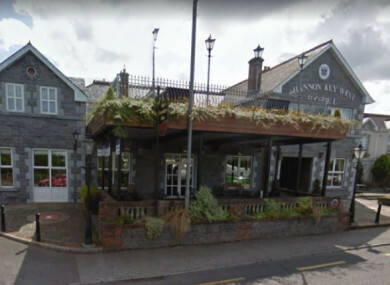 A spokesperson confirmed the decision and said the department “regrets that it is not in a position to proceed with plans to open an accommodation centre in the Shannon Key West Hotel”. They said the decision was taken following legal advice sought from the Chief State Solicitor’s Office which “found difficulties with the lease agreement between the owners of the hotel, and the operator renting it, which made proceeding with the proposed centre unviable”. The spokesperson said the department is “not party to these lease arrangements and these matters are outside our control”. They added that the department remains “committed to sourcing suitable premises to meet the accommodation needs of people in the international protection process”. A regional procurement process for new centres to house asylum seekers is currently under way and will continue throughout the year. Concerns have been raised about the rural location, and related lack of services, of some current and planned DP centres. The former hotel in Rooskey was subjected to two suspected arson attacks in January and February. The site of another planned DP centre, in Moville in Co Donegal, was also subjected to a suspected arson attack in November. Both centres were due to open in January but the process was delayed after the fires. The department’s spokesperson said the decision not to proceed with the Rooskey centre was taken “solely in relation to the difficulties with the lease”. However, Leitrim And Roscommon United Against Racism believes the suspected arson attacks are linked to the move. In a statement released today, the group said: “Nobody apart from the government thought it was a good idea to house 80 asylum seekers in Rooskey. However is regretful that the government appear to have backed down in the face of racist arson attacks and a vocal hard-right minority in this area. This will be portrayed by the far-right minority in our communities as a victory for them. The group said the legal issues surrounding the use of the former hotel as a DP centre “should have been tested fully in court”. The statement added that today’s announcement “may very well have a negative impact on the ability of the State to house asylum seekers elsewhere”. Almost 6,300 people live in 38 Direct Provision centres across Ireland, most of which are privately run. As of this month, 729 individuals have been granted protection status or permission to remain in Ireland – 206 people have refugee status; 441 people have permission-to-remain status and 82 people have subsidiary protection status. Close to 450 people have been living in DP centres for over five years as they await a decision on their status or subsequent appeals. Email “Plan to open Direct Provision centre in Leitrim scrapped ”. Feedback on “Plan to open Direct Provision centre in Leitrim scrapped ”.